Most important fact to optimize your blog to search engines is your blog Loading Speed. If your blog speed is very slow, readers don't like your page. Because your blog page is getting too much time to open and this is indirectly affecting your page ranking, or your search engine ranking. 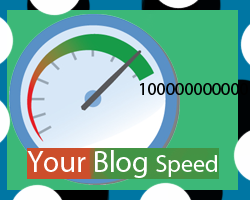 So today i tell you some factors affecting the loading speed of your blog page. Don't use Heavy Java Scripts, Html, and CSS, coding to your blog. Because this is one of the big issue to load your page speed time. So always use light coding on your blog. if you are using any image, photo on your post, you just use your image in PNG, Format. Because JPEG or other format image are directly affected on your blog speed. And always use the image in your post content related, because the image is very helpful to your blog reader to know about your post story easily. One of the most difficult things that you will be doing for minimizing the loading time of your blog. One of the best ways to do this you just clean (Database Connection Error), even if you are making the every single and smallest of the mistake. So one of the best things to do is to use the (Google Webmaster Tools) and remove you all post related and your blog error's. Which is the best platform for blogging?, and my answer is "Blogger" and your blogging platform are directly affected on your blog speed too. I always suggest for new bloggers to use (Blogger) and blogger is free of cost and you don't waste your money.